By now, students wishing to apply for University will have submitted their UCAS applications, and some may have already received offers. We’re aware that some students may not have received offers or may have had a change of heart. UCAS Extra is the perfect opportunity for students to make the right decision for their future by allowing them to make extra applications for university. Below is a guide on how to use UCAS Extra and some helpful advice for your students. Students who haven’t received any successful offers from their five choices, or have declined any offers they have received, are eligible to apply for courses through UCAS Extra. This is often a life-line for students who may not have made the right decision the first time round. UCAS Extra opens on 25 February and runs through till 6 July, allowing students plenty of time to apply for a courses at a university of their choice. 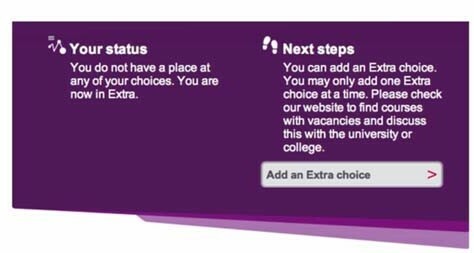 On UCAS Track, an ‘Add an Extra choice’ button will appear; allowing students, who are eligible, to add another choice of university. Using the course search tool, students can search for courses available through UCAS Extra by clicking the ‘Show Courses in Extra’ button. It’s important for students to ensure they are eligible to apply for the course they have chosen by checking the entry requirements; these are available on the UCAS and university websites. If students are unsure if they’re eligible, please advise them to call the university to make sure – doing so will not affect the university’s decision. Students will have to confirm whether they need to change their personal statement or if they can re-submit their original. The university of their choice can confirm this. We suggest students always submit a personal statement that is relevant to the course they wish to apply for, and one which highlights their experience, skills and motivation in studying the course they’re applying for. Students are only eligible to apply for one course at a time through UCAS Extra, and must either wait for a response from the university or reject the application to make a new one. it’s important to note that once a choice has been made through UCAS Extra, it cannot be amended for 21 days, or until the university makes a decision. Once an offer has been received, the student must make a decision by the time stated on UCAS Track. If a student accepts an offer through UCAS Extra, they are committed to it and can’t apply elsewhere. If a student declines the offer, they’re eligible to reply through UCAS Extra until July. Once UCAS Extra closes in July, students who haven’t received any offers are able to apply for courses through UCAS Clearing. This is an opportunity for students to get a place on a course that still has vacant places. We offer a wide range of services for students and staff on the UCAS Extra and UCAS Clearing process’, including visiting your students to help them through the process.